While you’re looking at any menu in-game (like the custom paint job menu in the mod shop for example) if you press and hold RT (R2 on the PS3) then you’ll scroll through the items much faster. Head to the location shown below and you should find that some Mesas have spawned. Be warned though, you’ll need to be heavily armed as you’ll need to fight for them!! At level 12 you will get a phone call from Merryweather Security and they will be added to the contacts list on your cell phone. You can then call them up and ask for help on missions, they are expensive though! When doing this mission it’s a good idea to just run (or better yet drive) to the RV and then drive straight (and we mean straight) to the drop off point. This means you should be driving off-road most of the way and will also mean that you avoid a lot of the bad guys you’d otherwise encounter. 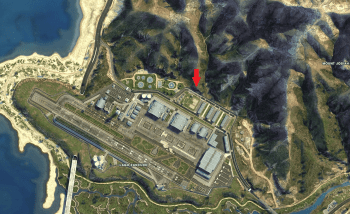 You can check out one method of getting into the military base in this video, but there’s another way too. Simply roll down the hill shown in the map below and it will get you over the fence! The other way is probably a lot more fun/entertaining though! It gives you a 5 minute window in which to get what you want/need and then get the heck out of there! Here’s another Los Santos Customs resell glitch that uses the Traffade Adder (yes, you’ll need one). The thing is that you can earn a lot more than the other glitch doing it! First buy the Traffade Adder and as many uopgrades as possible/you can afford from Los Santos Customs. 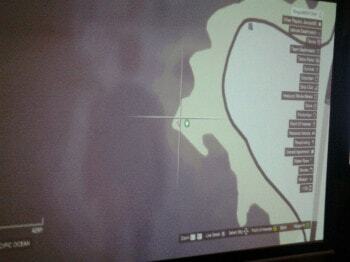 Leave LSC, press pause, then go to online –> options and set the Spawn Location to “Last Location”. Then switch to single player mode and start a new story, and from there go to play an Invite Only session of GTA Online. Get in your Adder and drive to LSC. Don’t go in, but instead park somewhere close. Then steal another random car and drive it into LSC. Select to sell it, but STOP when it says “Are you sure you want to sell this vehicle?”. Instead, at that point press pause and launch the Xbox Games Store or the Playstation Store. Once it’s loaded, back out of it and you should be in your stolen car in LSC. Choose to sell it again and again, STOP when it says “Are you sure you want to sell this vehicle?”. At this point again, press pause and launch the Xbox Games Store or the Playstation Store and then back out of it again. This time however you should be back in your Adder outside of the LSC. Now you can drive into the LSC in the Adder. Sell the Adder (actually sell it) and then press pause and launch the Xbox Games Store or the Playstation Store. Then back out of it. You should respawn in your Adder (even though you just sold it). So at this time just repeat steps 10 and 11. Note: If you get a message along the following lines “We’re not buying cars right now” it just means you need to wait 48 minutes (which is 2 days in-game time) and then try again.